If you’re new to woodworking and looking for the right equipment, choosing a table saw might not prove as easy as it looks. 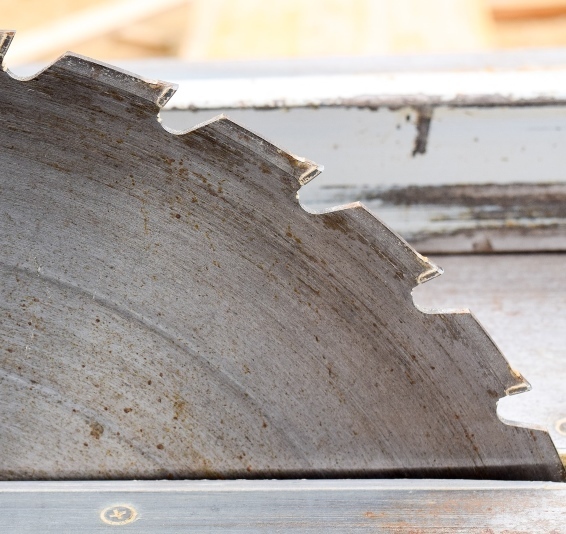 There are dozens of things to take into account from the product sturdiness and price to safety measures and blade quality, and comparing all the table saws out there can certainly give you a headache. To get started, you first need to determine how often you plan to use your table saw (it’s great if you have enough money for a SawStop, but it’s a wasted investment if you won’t be using it for more than a couple of hours per week) and for what kind of woodwork. Decide on a budget and stick to it, while keeping in mind that cheap models with bad reviews are not only frustrating to use but often times unsafe. I decided to do mini-reviews and a comparison of six of the best table saws for beginners. I also provide you with my best pick to help you make a good decision and learn about what to look for when making a purchase. While there are much more sophisticated DEWALT models out there, this one is perfect for beginners with a limited budget. The DW745 won’t blow your mind with exceptional design or durability, but you get plenty of bang for your buck. Don’t get discouraged by the low wattage because the blade spins at a no-load speed of 3,850 rpm, fast enough for nice, clean cuts. The Site-Pro Modular and Guarding System allows tool-free adjustment of application guarding components, which is a nice touch. Even though the DW745 comes with a dust collection port that lets you connect the saw to a Shop-Vac and clean the dust faster, the port isn’t large enough to stop the occasional clogging and dust flying all over the place. The plastic top plate isn’t something I’m very happy about either, as this kind of material doesn’t have a long life expectancy if you use the table saw (1) regularly. Still, that’s the price you pay when you opt for a cheaper model. Safety: Comes with the Site-Pro Modular and Guarding system, blade guard, push stick, and miter gauge. Go here to get the current price of the DEWALT DW745! If you talk about high quality and affordability in a worm drive table saw specifically designed for ripping, the SKILSAW SPT70WT-01 is probably the first thing you’ll mention. This table saw is indeed second to none. This table saw is the first of its kind; it provides a horsepower of 5.0 and possesses a 25 in. rip capacity, and the best part is that it comes with everything you need such as a miter gauge, cutting blade, hex wrench, push stick, anti-kickback device, rip fence, and much more. A durable power tool is important for every woodworker because durable tools give you value for your money, and this is what the SPT70WT-01 stands for. This advanced table saw has been put through rigorous testing and it is not a product that will fail under intense pressure, which is exactly what you need. Cutting power is also a factor every beginner woodworker should consider before getting a table saw – the extra torque is an important feature of this model, as it has the ability to cut faster and better than most table saws. Safety: The light weight and anti-kickback feature of this product makes it easy to move around and lowers the risk of injury. Go here to get the current price of the SKILSAW SPT70WT-01! For those looking for the best value for money, this model might be the right choice. Bosch is well-known for high quality equipment, and despite some complaints about the GTS1031 not meeting the usual Bosch standards due to a relatively large number of defective units, it’s a great tool if you ensure you have a properly working unit. Despite being a portable table saw, the GTS1031 is sturdy and well-designed. Its light weight allows you to carry it easily, and it comes equipped with a carry handle that leaves one of your hands free when moving it. The storage capacity of the unit isn’t too large, but it’s more than enough for beginners who want to store basic tools. The motor wattage of 1700 watts is plenty of power for cutting through dense wood without any problem, and a convenient feature allows you to plug the table saw into any regular household output without the need for additional power sources or converters. One of the major advantages of this model is that the SquareLock Rip Fence feature reduces the amount of waste, allowing you to get the most out of the materials you use. Safety: The Bosch GTS1031 has several safety mechanisms that decrease the possibility of injury during operation. It has a Smart Guard System modular blade guard that can be attached or detached within seconds, and it also comes equipped with a rip fence, push stick and miter gauge that come in handy for the beginner who doesn’t have a lot of experience under his belt. Go here to get the current price of the Bosch GTS1031! Makita is a worldwide brand known for excellence and perfection. Other brands are good, but Makita is on a different level and they have shown excellence yet again by manufacturing a simple and well-designed table saw model: the Makita 2705. The Makita 2705 promotes versatility and simplicity; it features a 15-amp motor which delivers a great 4800 RPM, an adjustable riving knife, release lever, large cutting capacity, electric brake, dead-on cam-locking rip fence, and the ability to use a 13/16″ dado blade. Versatility is an essential feature that every good table saw should possess, and the Makita 2705 is a model that has combined this with superior cutting power. Its motor improves performance by delivering 4800 RPM which is the right cutting power every beginner needs. This table saw is one that also increases convenience on the job site. The manufacturer has also included a stand, miter gauge, carbide tipped blade, wrenches, and a push stick. It is also safe and easy to use. Safety: The modular blade guard system is a unique feature to this model that minimizes the risk of injury, so you have nothing to worry about. Go here to get the current price of the Makita 2705! The first thing you’ll notice about this model (also reviewed in my guide for the best table saws under $300) will probably be its heavy-duty steel stand, as most models have stands sold separately. The stand has a quick-mount which allows you to set the table saw up fast and easy. Another amazing feature of the SKIL 3410-02 is the 3.5-inch cut height that enables you to cut through four times the material in one go, saving you time and effort. One of the best things about this model, especially for beginners, is the EZ view measurement system with a Self-Aligning Rip Fence, which produce accurate measurements. Still, the model’s low price means that there have to be some compromises. Many of the unit’s components are made of plastic. Also, don’t expect any advanced safety mechanisms, as this model has only a basic blade guard and a riving knife. If you’re strapped for cash, the SKIL 3410-02 will satisfy your essential woodworking needs. Safety: This model has a blade guard and a riving knife to prevent kickback, but no advanced safety mechanisms. On the plus side, the blade guard has a quick disconnect mechanism, so you can equip and unequip it in a few seconds’ time. Go here to get the current price of the SKIL 3410-02! Here is another Bosch model for those who are able to invest a little bit more in their first table saw. The 4100-09 is pretty heavy compared to other models we reviewed, but it has a Gravity-Rise Stand with 8-inch treaded pneumatic wheels that lets you move it around over almost any kind of terrain. With a tabletop that can extend up to 40.5 inches, this model is perfect for those who have need for a bigger surface. Just like its cheaper alternative we covered earlier, the 4100-09 also has the SquareLock Rip Fence designed to reduce material waste. Even when the machine is under heavy load, its Constant Response Circuitry feature will keep the motor running at a constant speed. The Soft Start feature enables smooth ramp up speed. Just like with most manufacturers, the blade Bosch provides with this model isn’t exceptionally good, and you should probably change it eventually for better results. One thing to take into account is that this model has the .091” kerf of the riving knife, which means not all types of blades will be able to fit into the table. While most beginners don’t have to worry about this, if you want to use the table saw with various blades, make sure you pick the ones compatible with the 4100-09 model. Safety: The 4100-09 model has a Smart Guard-System, a modular blade guard with anti-kickback pawls, and a riving knife system for improved safety. Go here to get the current price of the Bosch 4100-09! As you can see, each of the above models come with their pros and cons. If you’re looking for the best table saw for a beginner, the right choice for you will depend heavily on how often you plan on using the table saw, if you intend to move it around a lot, how much you want to invest in safety, and your budget. Still, if there is one model I would wholeheartedly recommend to any beginner, it would be THIS. Its advanced safety features come in handy to those unaccustomed to using table saws, and safety should always be your number 1 concern when working with this kind of equipment. While this model comes with a few disadvantages, its overall quality makes it a great choice for your first table saw, especially with features like the 20-inch rip capacity. Since most novice woodworkers and hobbyists don’t have the means of buying expensive table saw models, the affordable price of this model is one of its greatest advantages. Best of luck shopping for your table saw! Thanks for reading my buying guide. If you have any questions, feedback or comments, don’t hesitate to drop them in the comments below. Feel free to share this page using the buttons below. Glad to hear it Jeff. If you have any questions, don’t hesitate to ask. I am a professional and have used most of these. Dewalt is hands down the best. It’s fantastic for the price. Scott, I’m not surprised to see SKILSAW or DEWALT here. As someone who’s fairly new to woodworking, I got the SKILSAW SPT70WT-01 three weeks ago and it’s been great so far. I found the reviews to be really helpful in me making my decision. I will let you know if I experience any major problems. Nice, Owen. I am interested to hear what your experience ultimately ends up being with the SPT70WT-01 model.